For the album by David Benoit, see Freedom at Midnight (album). 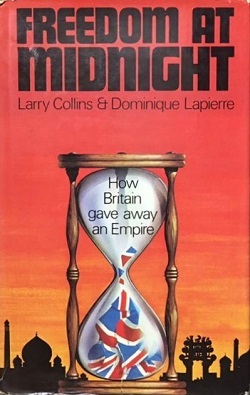 Freedom at Midnight (1975) is a book by Larry Collins and Dominique Lapierre. It describes events around Indian independence and partition in 1947-48, beginning with the appointment of Lord Mountbatten of Burma as the last viceroy of British India, and ending with the death and funeral of Mahatma Gandhi. The book gives a detailed account of the last year of the British Raj, the princely states' reactions to independence (including descriptions of the Indian princes' colourful and extravagant lifestyles), the partition of British India (into India and Pakistan) on religious grounds, and the bloodshed that followed. There is a description of the British summertime capital Shimla in the Himalayas and how supplies were carried up steep mountains by porters each year. On the theme of partition, the book relates that the crucial maps setting the boundary separating India and Pakistan were drawn that year by Cyril Radcliffe, who had not visited India before being appointed as the chairman of the Boundary Commission. It depicts the fury of both Hindus and Muslims, misled by their communal leaders, during the partition, and the biggest mass slaughter in the history of India as millions of people were uprooted by the partition and tried to migrate by train, oxcart, and on foot to new places designated for their particular religious group. Many migrants fell victim to bandits and religious extremists of both dominant religions. One incident quoted describes a canal in Lahore that ran with blood and floating bodies. Also covered in detail are the events leading to the assassination of Mahatma Gandhi, as well as the life and motives of British-educated Jawaharlal Nehru and Pakistani leader Muhammad Ali Jinnah. The authors interviewed many who were there, including a focus on Lord Mountbatten of Burma. They subsequently wrote a book based in particular upon their research on Mountbatten, titled Mountbatten and the Partition of India. That book contains interviews with Mountbatten, and a selection of papers that were in his possession. Freedom at Midnight is a non-fiction book told in a casual style, similar to the authors' previous Is Paris Burning? and O Jerusalem!. It aroused controversy for its portrayal of the British expatriates, the native rulers of India and members of India's first cabinet. James Cameron described it as the result of deep research into events often neglected by other historians. This book was one of the inspirations for the 2017 film Viceroy's House. ^ Gray, Paul (27 October 1975). "Books: The Long Goodbye". Time. ^ a b Gordon, Leonard A. (August 1976). "Book review: Freedom at Midnight". The Journal of Asian Studies. University of Cambridge Press. 35 (4). doi:10.2307/2053703. ^ Krishan, Y (February 1983). "Mountbatten and the Partition of India". History. Historical Association. 68 (222): 22–38. doi:10.1111/j.1468-229X.1983.tb01396.x. ^ Brasted, H. V.; Bridge, Carl (1994). "The transfer of power in South Asia: An historiographical review". South Asia: Journal of South Asian Studies. 17 (1). doi:10.1080/00856409408723200. ^ How Prince Charles steered filmmaker Gurinder Chadha to make Viceroy's House, Garry Maddox, The Sydney Morning Herald, 17 May 2017.